Signs of a Qatar–GCC Rapprochement: Should Iran Be Worried? While Saudi Arabia is still under heavy international pressures over the killing of dissident journalist Jamal Khashoggi, sings of a rapprochement between the Gulf Cooperation Council (GCC) and Qatar indicate to possible new developments in the Persian Gulf region. Almost one year and a half after a Saudi-led bloc, consisting of Saudi Arabia, UAE, Bahrain and Egypt, severed diplomatic relations with Qatar, imposing an air and sea blockade on the fellow Arab country, the two sides are apparently becoming ready to revive high-level contacts, at both political and military levels. In this vein, Kuwaiti Deputy Foreign Minister Khaled al-Jarallah declared in a statement November 20 that Qatar is expected to attend the upcoming GCC summit in Riyadh, which is due to be held in December. Earlier in November, Chief of Staff of Qatari Armed Forces Ghanem bin Shaheen Al-Ghanem joined his counterparts from the other GCC member-states to participate in a war game conducted in Oman. 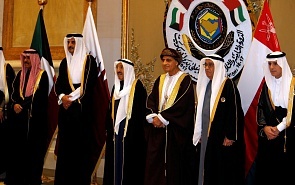 In fact, over the past several months, Qatari military officials have in several cases been present at joint events with their GCC counterparts. In discussing the reasons why Riyadh and its allies are seemingly show more openness toward re-engaging Doha in the GCC activities, two important trends have to be taken into account. On the one hand, the Saudi leaders, who are now facing an unprecedented and increasing international pressure over the Khashoggi case, are trying to evade international and regional isolation by resorting to a number of diplomatic initiatives. In fact, news about Qatar’s participation at the GCC summit came at the same time as Saudi Crown Prince Mohammad bin Salman was about to start a tour to a number of Arab countries to gain diplomatic support for the Kingdom. In the same vein, in his speech at an international investment forum in Riyadh in late October, bin Salman adopted a rather softer stance toward Doha, saying that “Qatar has a strong economy and although we have disagreements, after five years they will have a totally different situation.” In other words, the modified Saudi stance toward Qatar is part of bin Salman’s wider diplomatic plan to overcome the international pressures. On the other hand, the recent developments could be better understood within the framework of the US plans to unite the Arab states of the Middle East in form of a military and security alliance against Iran. In fact, since the time Donald Trump came to power as the president of the United States, Washington has defined the creation of a Middle East Strategic Alliance (MESA), or the so-called “Arab NATO” as one of its main priorities in the region. The main purpose of the alliance is said to be countering Iran’s influence throughout the Middle East. However, so far the main obstacle to the realization of this aim has been the diplomatic rift between Qatar and the Saudi-led bloc, which naturally prevents the formation of a unified Arab front. In this vein, since the onset of the GCC crisis, Washington has been pushing both sides toward a compromise, saying that they have to focus on a bigger threat – Iran – instead of getting involved in an intra-Arab confrontation. Now, with Saudi Arabia experiencing a weaker position than before due to the abovementioned pressures, the US seems to have found the best opportunity to persuade Riyadh to leave behind differences with Doha and enter a real process of rapprochement. Now, given all these facts and especially the US efforts to tighten the grip on Iran in the region, one may ask whether the Islamic Republic should be worried over the current developments and what real implications these trends could have for Tehran. Generally speaking, it could be said that despite all mentioned developments, Qatar and the Saudi-led bloc are still far from going fully back to normal and reuniting the GCC. First of all, having managed to survive despite the Saudi blockade and being aware of Riyadh’s weakened position, Doha now is in no rush to restore the former level of ties with the GCC. Instead, the Qataris are trying to dictate their own terms for a rapprochement with the Saudi bloc. Qatari Defense Minister Khalid bin Mohammad Al Attiyah said on October 28 that any rapprochement between his country and those who have imposed a blockade on Qatar is conditioned to their formal apology and the lift of the blockade. Meanwhile, given Qatar’s close alliance with Turkey, Ankara’s current strategy of keeping the pressure up on Saudi Arabia over the Khashoggi case, represented in Ankara’s insistence that the highest-ranking Saudi officials have been involved in the case, further complicates any rapprochement between Qatar and Saudi Arabia. ﻿﻿Jamal Khashoggi’s murder is one of the most mediatized cases in modern history. Rarely did a man’s fate provoke such an international uproar, taking up the attention of the US president for weeks and pushing western capitals to treat Saudi Arabia almost like a rogue state. The reaction surprised the Saudi leadership and tarnished its image abroad but it is unlikely to alter the policies of its de facto ruler, crown prince Mohammed Bin Salman (MBS). At the same time, the growing ties between the Ankara-Doha axis on the one hand and Tehran on the other, thanks to Iran’s support for Qatar since the imposition of the Saudi-led blockade, makes Doha think twice when it’s asked to join forces with the other Arab countries against the Islamic Republic. In fact, not only Doha has shown unwillingness toward siding with Washington against Tehran, it has declared readiness to act as a mediator between Iran and the US. All in all, it seems that while a number of signs are indicating to the restoration of high-level ties between Qatar and the Saudi-led bloc, differences between the two sides are real and persisting. As such, suggesting that the realization of an “Arab NATO” is now something on the horizon would be nothing more than wishful thinking.